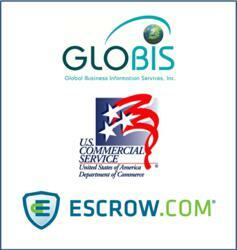 Escrow.com, a leading Internet escrow company, is pleased to announce an alliance with Glo-BIS.com, a provider of credit reports and due diligence worldwide, to collaborate on increasing U.S. exports by lowering the risks of non-payment from international buyers. This is just one example of how U.S. businesses...are working to support the President’s National Export Initiative, which aims to double U.S. exports by the end of 2014 while growing our economy. Escrow.com, the world's leading Internet escrow company, is pleased to announce an alliance with Glo-BIS.com, a provider of credit reports and due diligence worldwide, to collaborate on increasing U.S. exports through lowering the risks of non-payment by international buyers. “Our due diligence reports on any company, any size, anywhere in the world are all about mitigating risk; if you know the unbiased facts about that international partner, i.e., whether he has been sued for copyright infringement, is insolvent, etc., you can make a quicker decision whether to make that sale,” says GloBIS Managing Director Louise Kern. “But you also want to make sure that sale turns into cold hard cash in your bank account, which is where Escrow.com comes in,” she continues. When using Escrow.com, both parties agree to the terms online and the Buyer sends the agreed-upon funds to Escrow.com. Escrow.com then verifies the payment and instructs the Seller to ship the goods. Upon delivery, the Buyer has a pre-agreed-upon amount of time to inspect and accept the goods. Once accepted, the funds are released by Escrow.com to the Seller. “We do a lot of credit reports on Chinese companies. Escrow services are starting to take off in China, but they are run by local banks or online trading platforms and are not party-neutral like Escrow.com. When both sides can be confident the other party cannot swindle them, that is when the deal closes and the export is made,” stated Louise Kern. Headquartered in Rancho Santa Margarita, CA, Escrow.com, a privately held company, has pioneered the process of online escrow services. The Company, founded in 1999 by Fidelity National Financial, has established itself as the leading provider of secure business and consumer transaction management on the Internet. All escrow services offered on its Website are provided independently and exclusively by Internet Escrow Services(SM) (IES), one of the operating subsidiaries of Escrow.com. IES is fully licensed and accredited as an escrow company and is subject to compliance with all applicable nationwide escrow regulations. Founded in 2003 and headquartered in Chicago, IL, Global Business Information Services, Inc. (GloBIS), a privately held company, provides due diligence on companies and individuals worldwide, conducts highly customized Market Research, sells Import/Export Customs Records, etc. GloBIS has been the US Commercial Service’s International Company Profile (ICP) provider in China since 2004, in Iraq since 2011, and can do this type of report on companies everywhere.